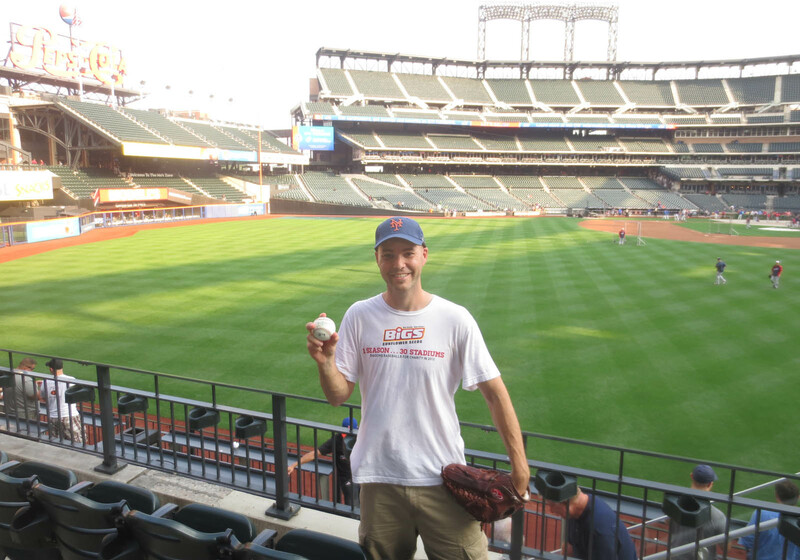 My first baseball of the day . . .
. . . was thrown to me at the start of BP by Mets pitcher Vic Black, and it was extra special. 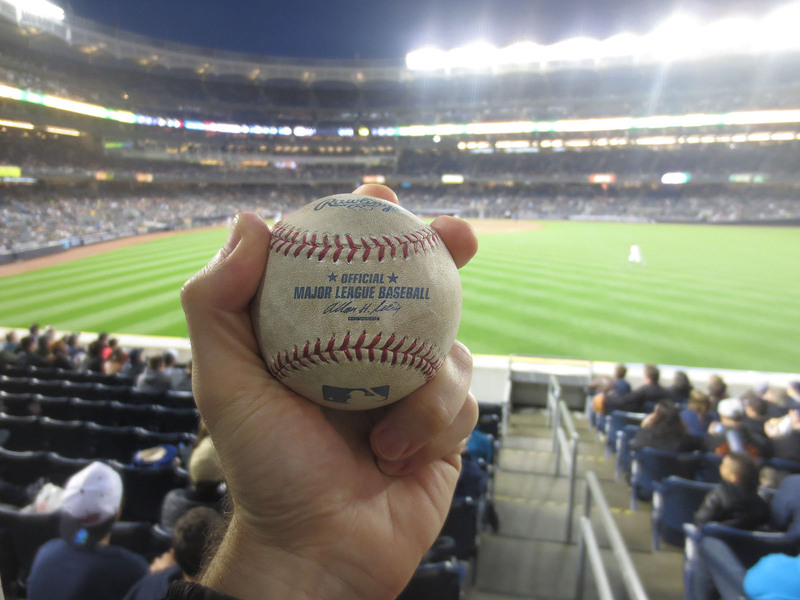 Not only was it the 700th ball that I’d ever snagged at Citi Field, but it marked an important milestone in my consecutive games streak. You know how I’ve gotten at least one ball at each of my last 951 games? Well, the first of those games took place on September 10, 1993, so this was the 20th anniversary. 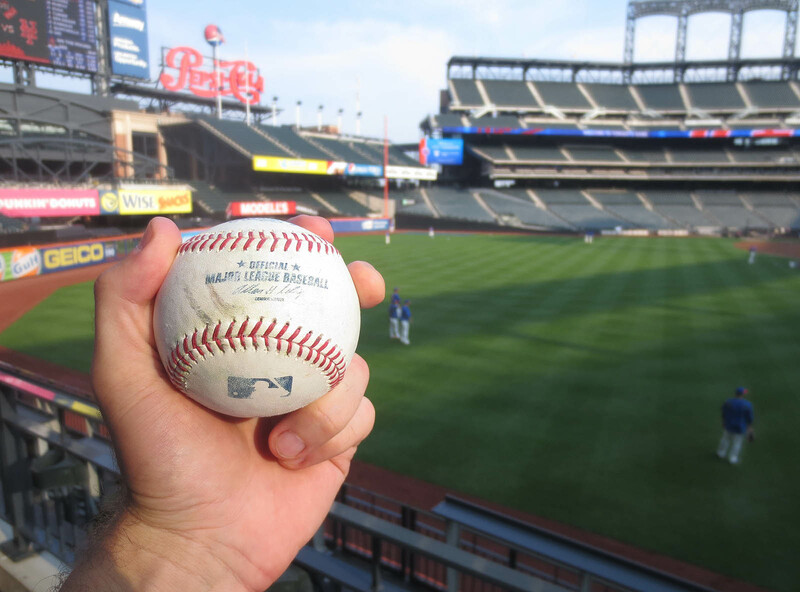 It’s funny how an ordinary ball that gets tossed up by a lesser-known player in an empty stadium can be so meaningful. When their portion of BP got underway, I caught three homers on the fly in the first group. 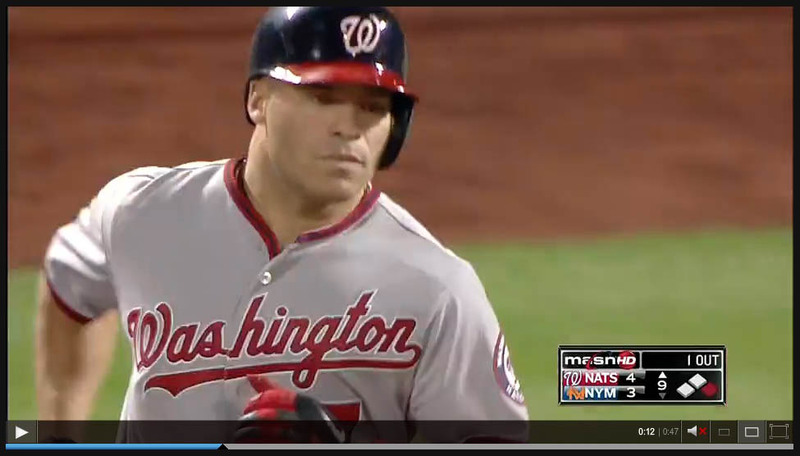 I wasn’t sure who hit them, but Griffin was pretty sure that Wilson Ramos was responsible for all three. 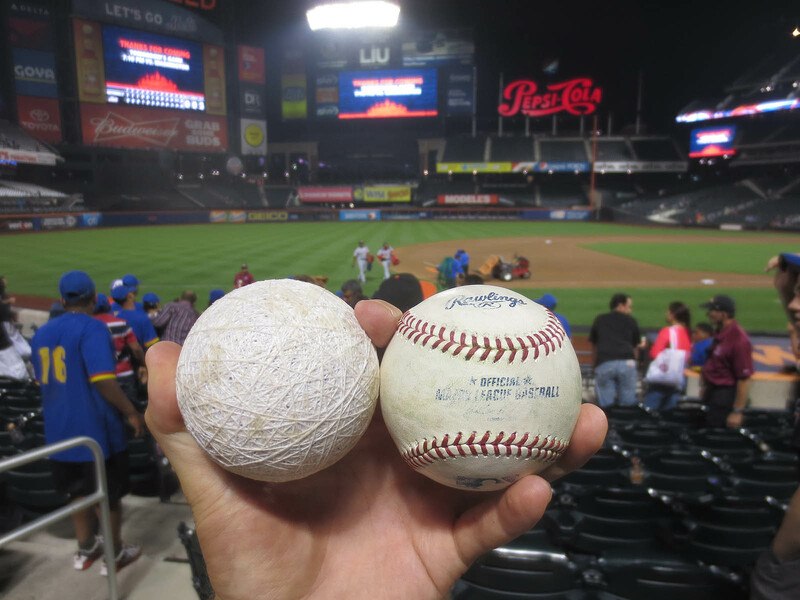 The first was a towering fly ball that forced me to reach over the railing in the front row, the second was a line drive that I caught on a semi-crowded staircase, and the third was another high fly ball that I caught after drifting 20 feet to my left. That’s all I got during BP, which is to say that I got shut out during the final half-hour. Things just weren’t going my way, and part of it was my fault. For example, on one home run, I drifted back several steps, only to watch it smack off the facade of the 2nd deck and bounce down into the front row. Then, ten minutes later, expecting a similar ricochet, I scurried down to the front row and watched helplessly as the ball fell short of the facade and landed several rows behind my original spot. Early in the day, I let my friend Greg catch a home run on my right (because he had gotten to the spot first), and later on, I let a guy named Jeff catch one on my left for the same reason. To Jeff’s credit, he didn’t have his glove on at that moment and caught the ball bare-handed. I can’t really complain about snagging five balls during BP (including four homers on the fly), but with a bit more luck and less stupidity, I could’ve easily hit double digits. Before the game, I made my way down toward the left field foul line . . .
I’d brought my 7,000th ball with me, hoping to get him to sign it. 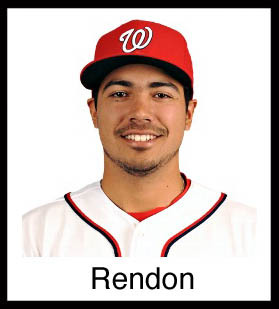 (You may recall that he hit that ball during BP on 8/27/13 at Nationals Park.) Evidently he was really busy staring at the warning track because when I shouted, “Anthony, can you please sign one?” he barely turned around long enough to shake his head and wave his hand dismissively. I stood there for a couple of minutes, trying to think of something else to say or do. “Anthony! !” I eventually shouted louder than before. “Can I tell you something really fast?! It’ll only take ten seconds!! I expected him to ignore me, but he actually turned around, so I kept talking . . . It was impossible to interpret his reaction. All I can say is that (a) he definitely heard every word I said and (b) he seemed to nod at the end. I don’t know if he was nodding just to be polite so that I’d shut up or if he was considering my request or if he was actually indicating that he’d sign for me the following day, but in any case, I gave it my best shot. As you can see, it wasn’t exactly crowded out there . . . and two women were sleeping in the row behind me. They were totally passed out for a solid inning or two, prompting several other fans in the section to take photos of them while posing nearby. 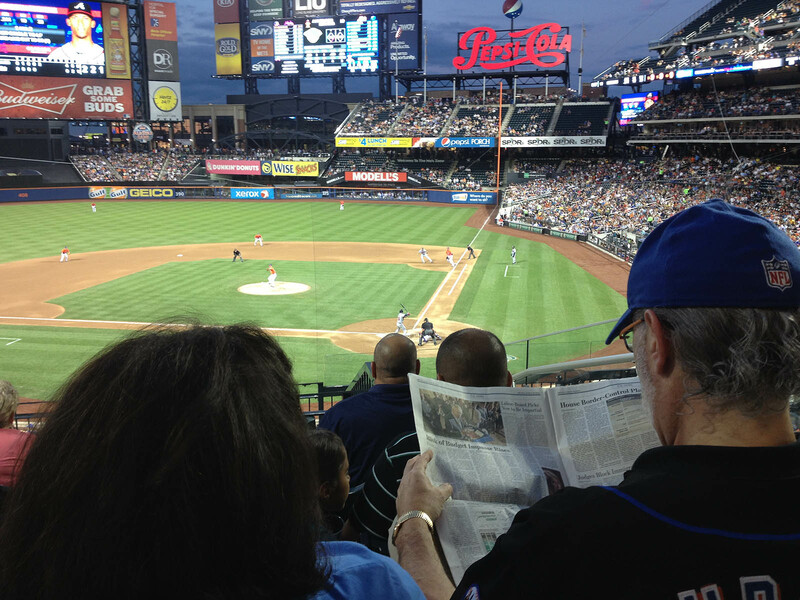 I know it’s depressing to watch the Mets and that fans need some sort of escape, such as reading a newspaper or playing a dopey video game, but sleeping?! That’s a new one. Everyone knew it was gone . . . 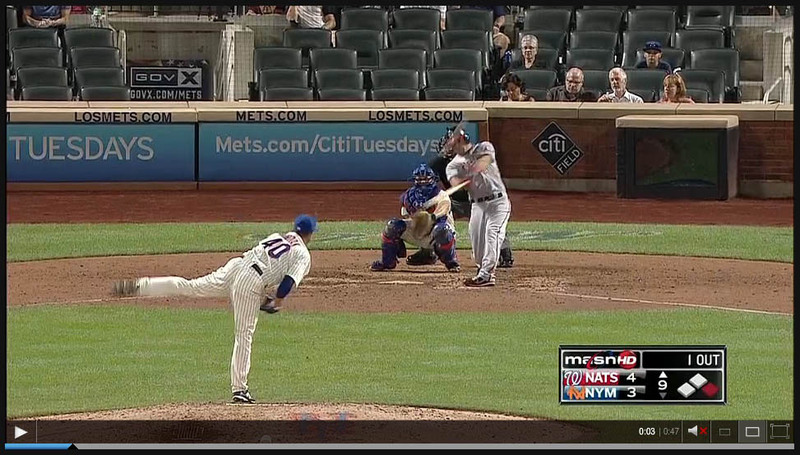 The ball was heading toward a large man who was standing in front of the end seat. I didn’t know if he was going to try to catch it or if he’d end up flinching at the last second. All I could think was . . . I’m going for it. This was a GAME HOME RUN. I just couldn’t let it go. It was a tough catch because (a) I was still moving forward toward the railing as the ball landed and (b) the big guy made his own attempt to grab it . . . literally. I shouldn’t really have been surprised. 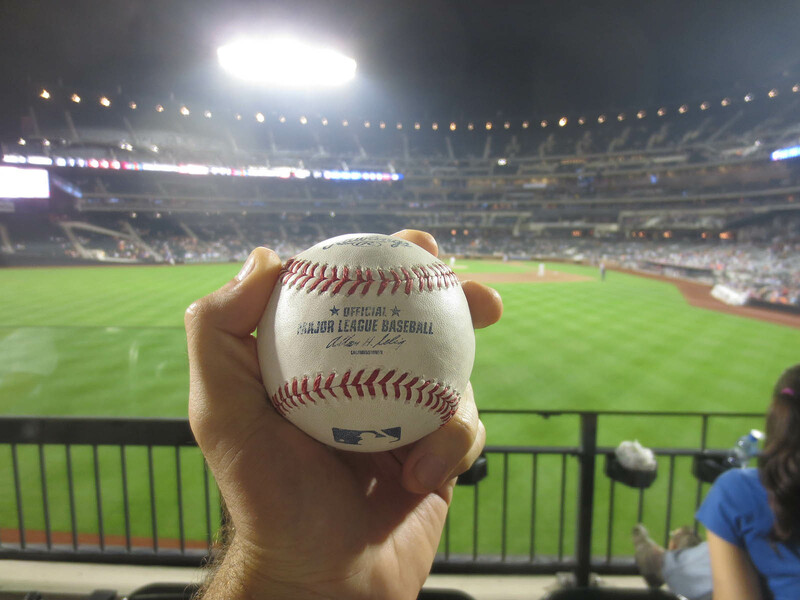 It’s not like this was the first home run I’d ever caught, but it was the first for me this year at Citi Field — and this was my 20th game here. 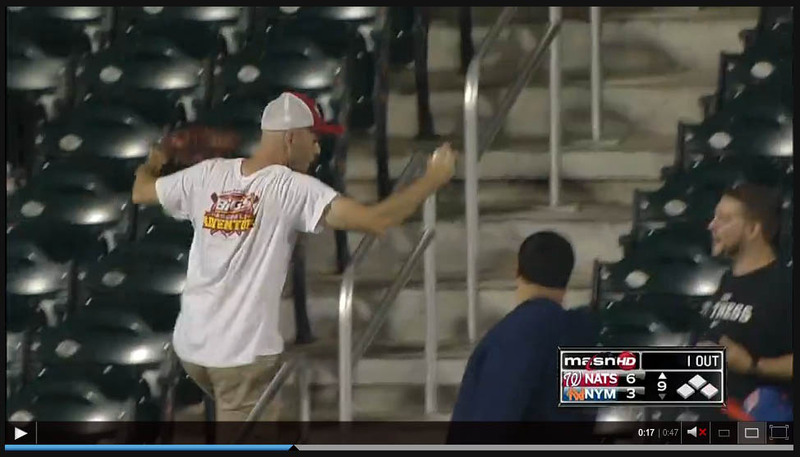 I guess I was surprised to have come up with the ball after running so far and tussling with that fan. As Hairston rounded the bases . . .
. . . I headed back to my seat . . .
. . . and thought about apologizing to the fan. I really did feel bad about having reached in front of him, but on the flip side, he shouldn’t have tried to take the ball from me after I’d caught it. Back in my seat, I photographed the ball . . . Still hoping to make nice, I started to apologize, and the big guy was like, “Don’t even worry about it, bro.” He told me that I’d made a great catch, and when he saw my shirt and heard about the charity, he said, “It’s good that you caught it because if I’d gotten it, I probably would’ve thrown it back on the field.” His friends were teasing him for having failed to catch the ball, and they were all excited about seeing themselves later on SportsCenter. 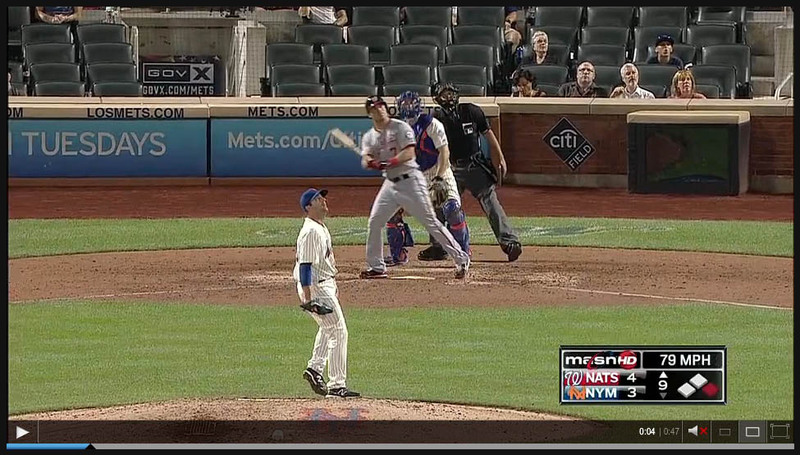 1) It was Hairston’s 105th career home run, and by the way, here’s the video of it. 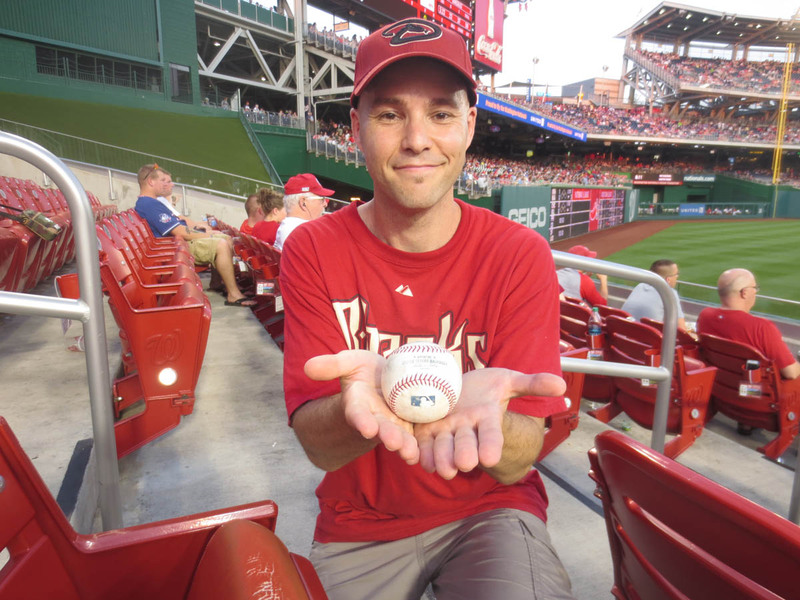 2) It was my 26th game home run ball (not counting toss-ups). 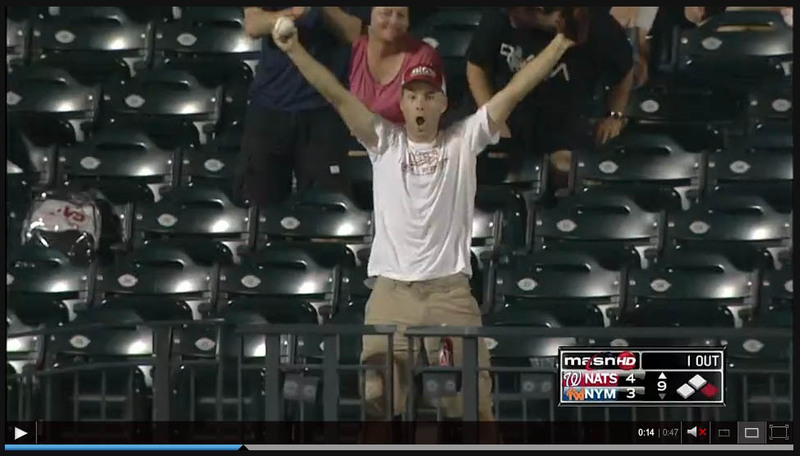 3) I’ve caught game home runs on the fly in three different stadiums this season. 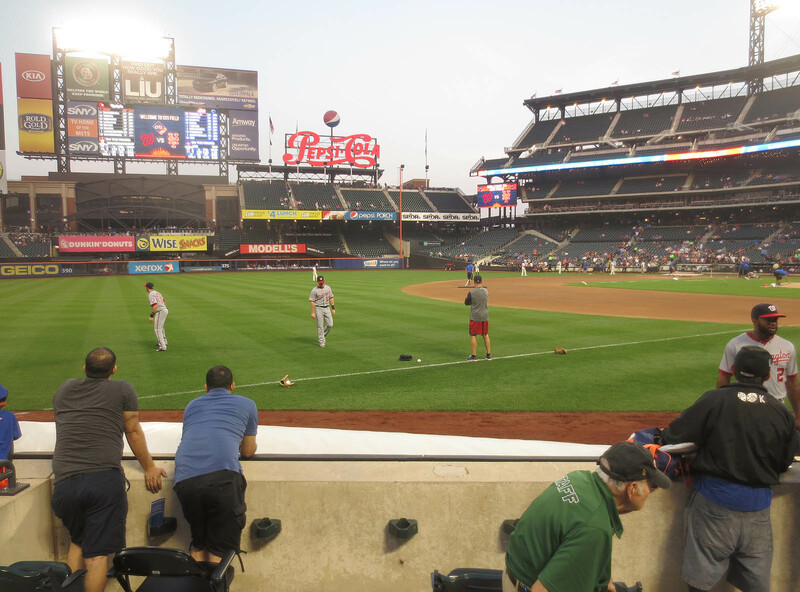 I was about 10 rows back when one of the players threw me a ball. 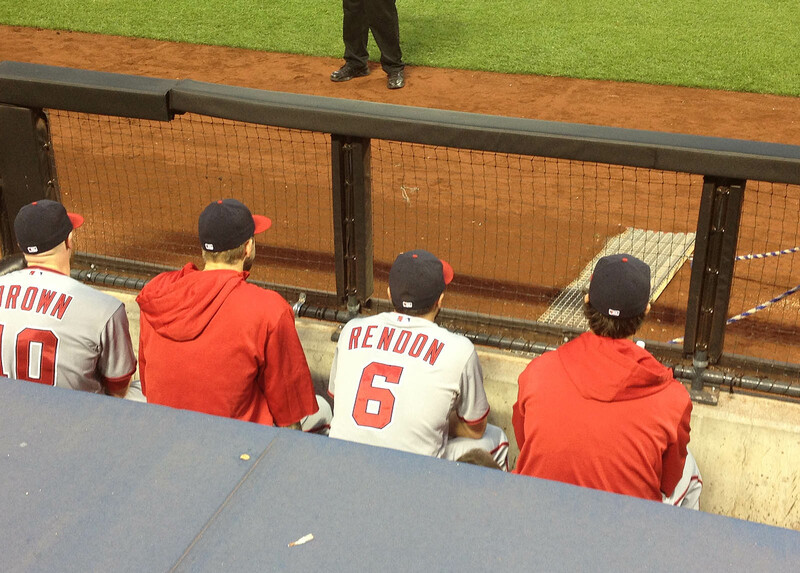 (Greg was certain that it was Ross Ohlendorf, but I’m not so sure.) I didn’t realize until after I’d caught it that the cover had been removed. When I looked back up at the player with a “WTF” expression, he was laughing and holding another ball, which he threw to me. Those are the two balls pictured above, and yes, I’m counting them both toward my grand total. 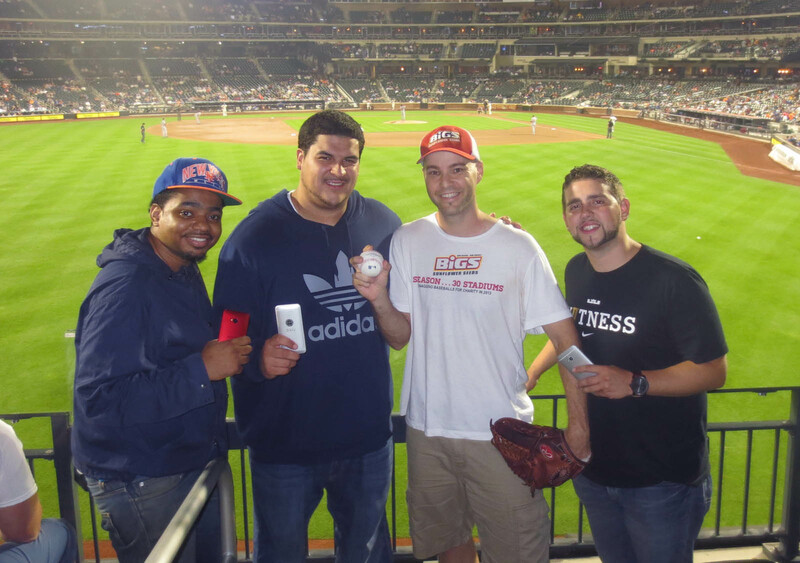 Remember the coverless ball that I snagged from a bullpen gutter on 8/23/13 at Citi Field? I decided to count that one, so there’s no reason why this one shouldn’t count as well. What a wacky day — and it wasn’t quite done. 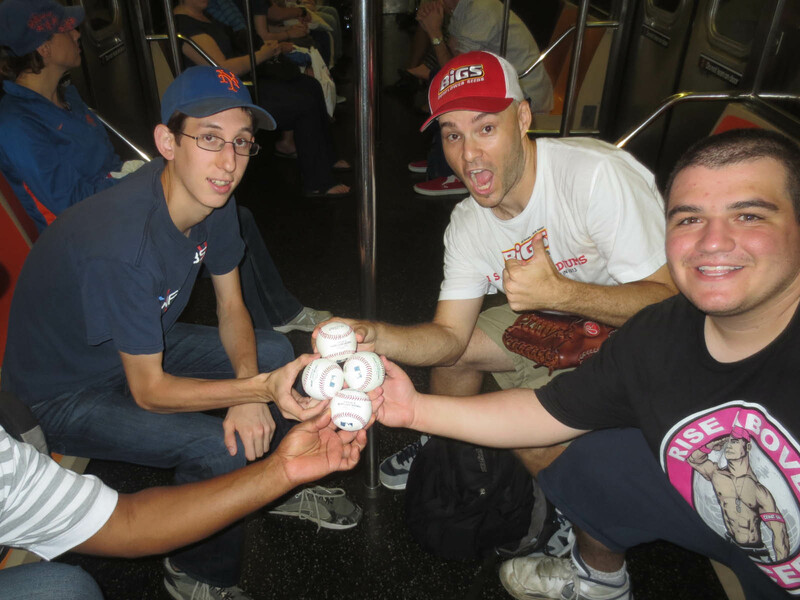 On the 7 train back to Manhattan, Greg and Griffin and I decided to “triforce” by “touching our balls together,” but as you can see below, it turned out to be a . . . quadforce? Greg ended up with seven baseballs at this game; the guy reaching out with the striped shirt got four and wishes to remain anonymous. • 598 balls in 79 games this season = 7.57 balls per game. • 707 balls in 91 lifetime games at Citi Field = 7.77 balls per game. Don’t even think twice about snagging that home run. As long you didn’t push him over, it’s perfectly fine to reach for a game home run ball. You snagged it fair and square. Things are definitely fun in KC right now. The Royals are actually in a September race. First time ever for Zachary and Connor. We plan to hit 3 more games at the K during their final homestand. Zachary is sitting at 49 balls this season. Not bad for a 10 year old! 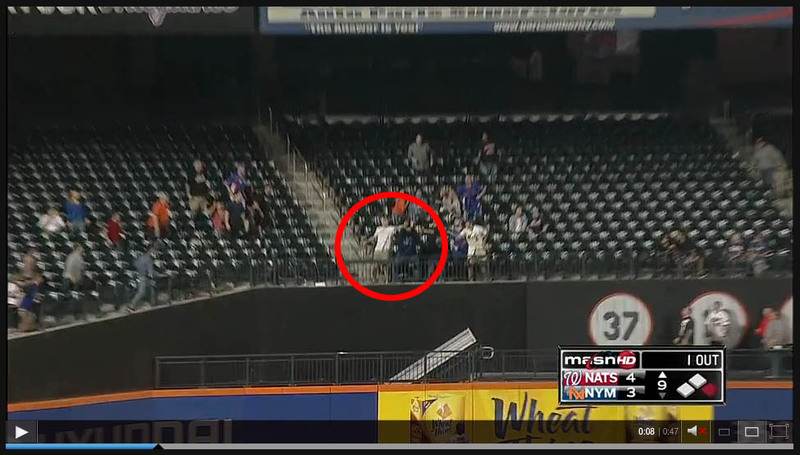 Zack, there is no guarantee that the gloverless fan would have actually made the catch bare handed, and the ball could have fallen down below for someone in the party deck to snag it. And how many times have someone reached in front of you during BP to snag a ball away from you at the last second? So no apologies needed! It is amazing how you can tell where the ball will land, and you can actually get to that spot right on time to snag it, all in mere seconds. Zack…wow…much props to you!.. That was one of the best ball hawk home run catches I have ever seen when you take into account how far you went to get there and somehow just made the catch with out knocking anyone over!… a tip of the cap to ya! 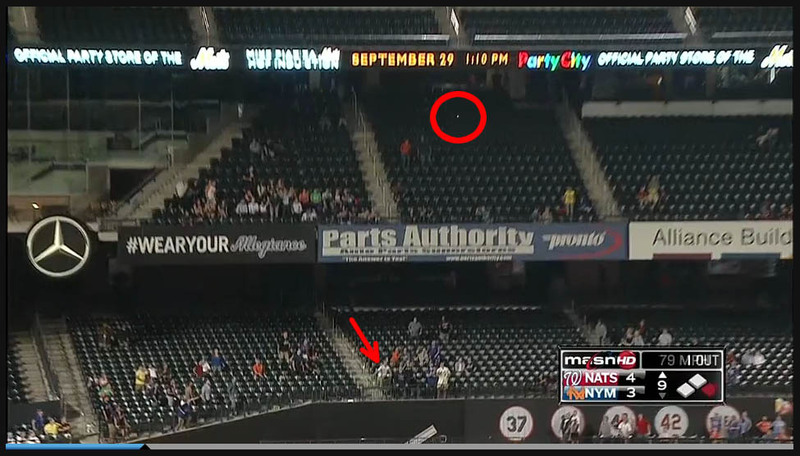 I’ve been watching the highlights of the NYM-Washington series to see if you caught any homers, and as soon as I saw this white streak heading for the ball I knew it was you. As you know, I have some experience watching you track baseballs. So cool. Hope you get one tonight. Honestly after watching the video, you should have let him catch it. Clearly you reached over him and entered his seat. Luckily he was chill about it. His friends were like WTF expression. You basically robbed that guy. you remind me of myself 20 yrs ago in qualcomm.hairston is a good hr hitter ,man padres should have kept him..one of these days you ll learn to carry a spare ball and just flip the robbed fan one .thats your trademark the O face and arms up.wheres the celebratory dance? TC . It does look a little unseemly with you reaching in front of the dude to catch the ball, but it was really just the context — a completely empty stadium. 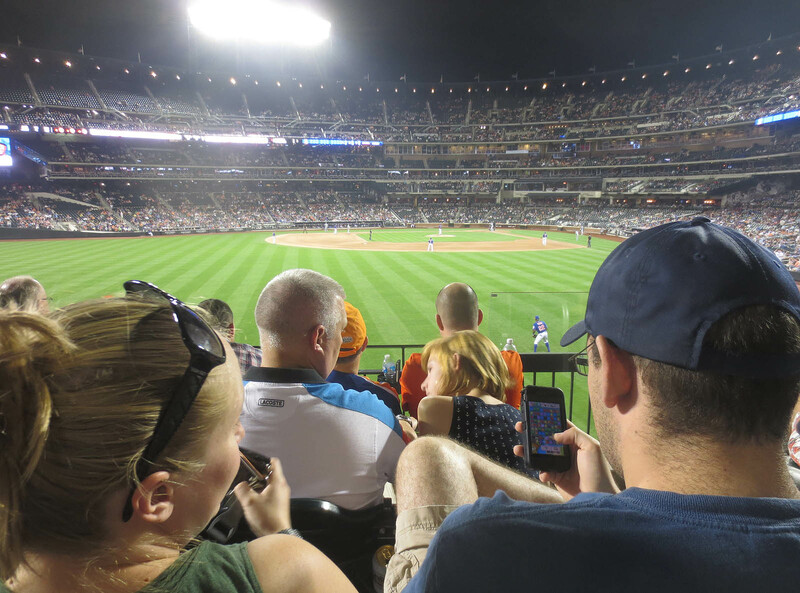 If the Mets had a real crowd, there probably would have been 5-10 hands reaching for the ball and no one would cry foul about it (not that anyone really did here). 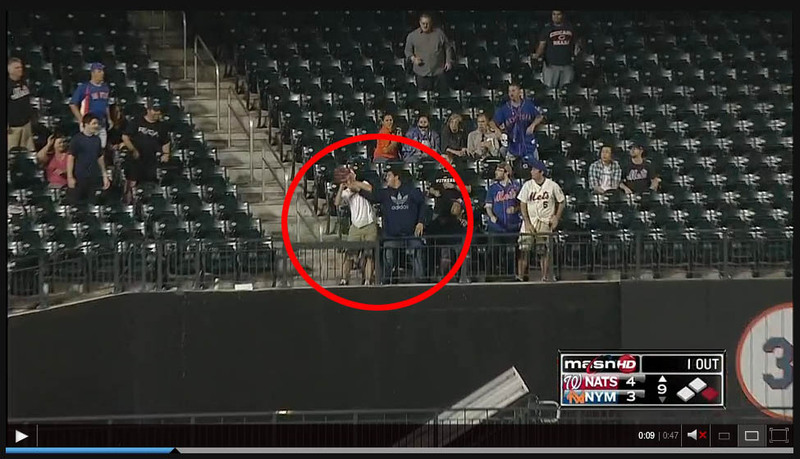 But it just looks different when there are only about 10-15 people in the entire LF bleachers… Anyway, nice catch! Congrats. I’m glad the guys were cool about it. Props to them. 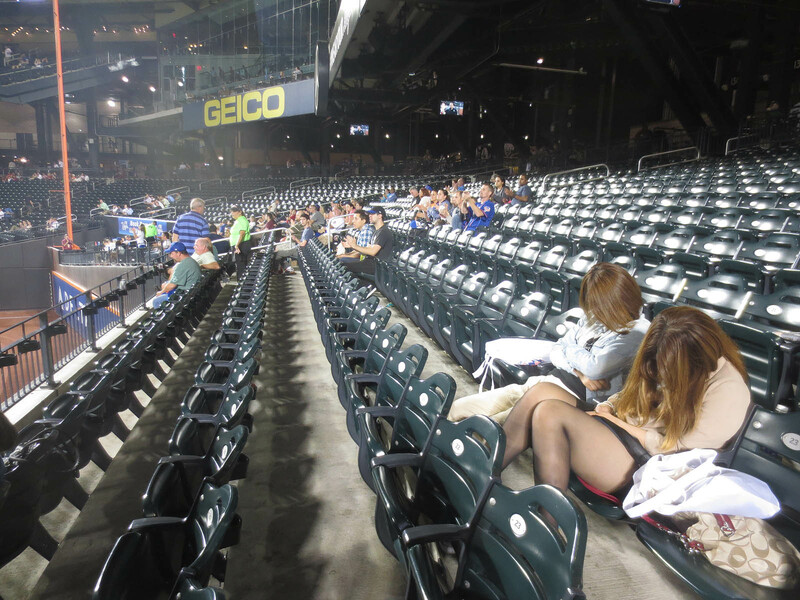 Do you think the crowd is going to be like this when we go to the Mets brewers game? And was denard span signing autos? Thanks. I appreciate that, and congrats to Zachary. He’s well ahead of my pace. Thanks. There are many ways to think about it. I like your reasoning. Thanks. I’ll be tipping my cap to you (from afar) during the All-Star festivities. I expect you to put on a show! Alas, no homers tonight. 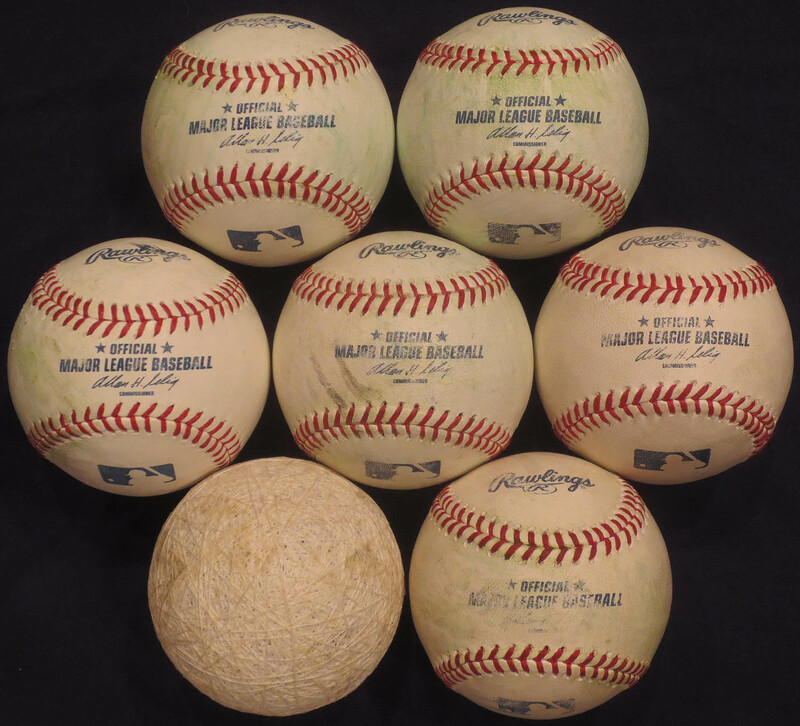 I know we were supposed to talk about possibly making some kind of arrangement this week at Citi, but it’s been rather dull in the commemorative ball department. Maybe I’ll see you next month at Fenway? Well, that’s another way to look at it. I’m not sure I agree, but I respect your opinion, and I’ve certainly been replaying the whole thing in my mind. I wish I could see some footage of you doing your thing at Qualcomm back in the day. I’ve retired the dance moves, but hmm . . . maybe I should bring them back. Your take on the home run is perhaps the most sensible of all. Thanks, as always, for your thoughtfulness. I would expect a small crowd when we’re there — probably close to 20,000, but of course that’s just the number of tickets sold. There might only be half that many people actually in the stadium. I didn’t see Denard signing. He might have, but if he did, I missed it. Z-Man, people tend to vie for those kind of balls, so I am not ready to castigate you. I like Todd’s take as well. I think I saw Mateo going for a home run ball tonight at Target Field. If Mateo reads this, were you wearing a lime colored shirt? I will be at the K for the Indians/Royals series next week as well and can’t believe the Royals are still in this thing. I am realist, but this is fun. Thanks, Mister Bob. Wish I could join you at the K. Maybe next year. I’m determined to catch a home run ball in that stadium. Z-Man, those outfield cross aisles are indeed glorious as is that entire stadium. My second home. But, as Garrett has pointed out, it is a big park and you are talking about 420 or so foot shot. Not that there aren’t guys that can reach that distance, but in all my games at the K I have seldom seen it. The bullpens eat up a lot of homers. 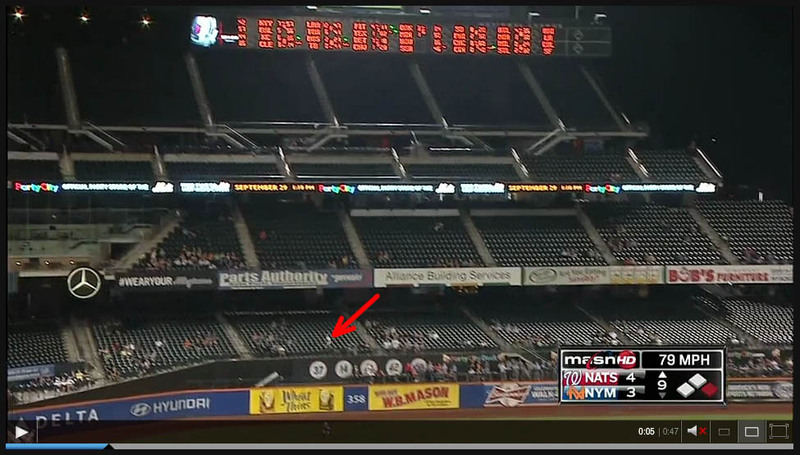 The one time I went for a game homerun (when Mauer was sitting at 99) I camped out at the top of section 107. That entire section and the one next to it are only occupied if it is a well attended game. Otherwise those sections can remain totally empty. 107 is only a 330 poke down the LF line and for righty’s that are dead pull hitters or guys like Mauer that like to go opposite field, it is a solid spot to stand. A guy like you that has good range and off the bat recognition skills could stand in the cross aisle there and be able to run down or range over for a ball that might clear the home bullpen. Nice catch Zack. I got a Scott Hairston walk off homer back in 2007. We really loved that guy here. I really hope this doesn’t happen to you, but I just have a feeling that one day…..your luck is going to run out and you’re going to reach in front of the wrong guy and…….something bad is going to happen. Nice catch though. Good luck the rest of the way this season. Yeah, I realize how deep the dimensions are, but I don’t think I *really* realized it until this year. One thing’s for sure: that stadium is beautiful. You’re very kind. I’m behind on all my emails (and just about everything else in life), but I’ll find you soon. I very rarely reach in front of people, and when I do, it’s on a BP homer, and I almost always give them the ball . . . but I hear ya. I do try to be careful and respectful, but on a game home run, I think it’s fair for anyone to try to reach in front of anyone.